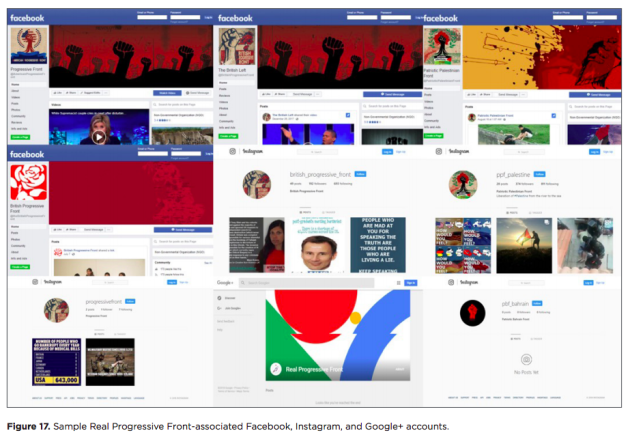 Google, tipped off by FireEye, identified 39 YouTube accounts, six blogs on Blogger and 13 Google+ accounts linked to the Islamic Republic of Iran Broadcasting through its Threat Analysis Group, working in partnership with Jigsaw and Google’s Trust and Safety Team. 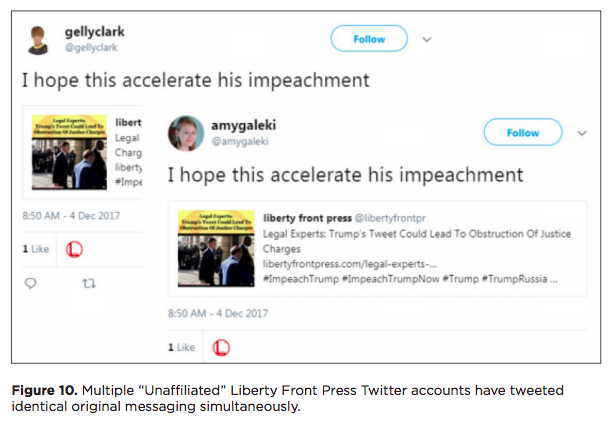 “Actors engaged in this type of influence operation violate our policies, and we swiftly remove such content from our services and terminate these actors’ accounts,” Google said in a blog. Last year, Google removed 42 YouTube channels linked to the Russia via the Internet Research Agency. Google has also been working on combating phishing, warning Gmail users about “suspicious emails” from a wide range of countries. 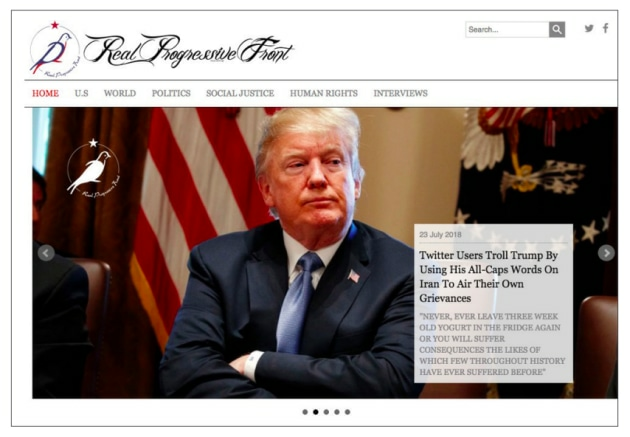 Twitter has banned 284 accounts originating in Iran for “coordinated manipulation”. 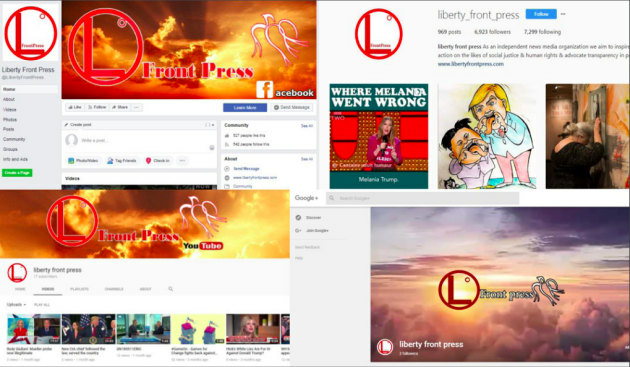 In July, Facebook was tipped off by FireEye to the existence of a network of pages linked to Iranian State Media known as Liberty Front Press, which led the social media network to investigate. 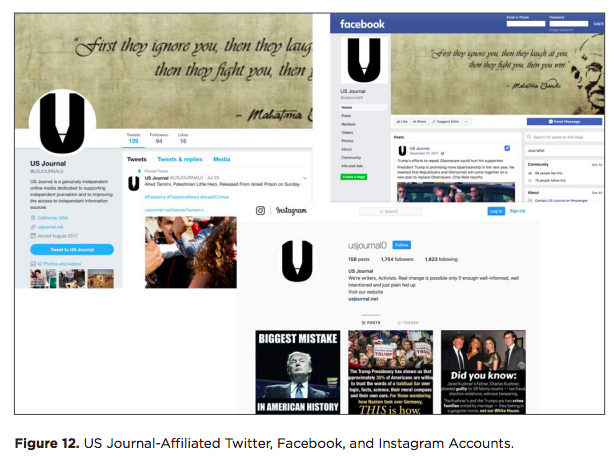 It found 74 Facebook pages, 70 accounts, three groups and 76 Instagram accounts with a combined following of more than 200,000 users. 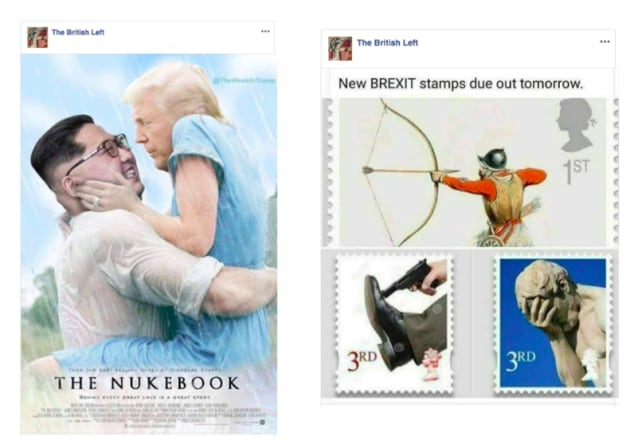 More than $6,000 was spent running ads on Facebook between January 2015 and August 2018. 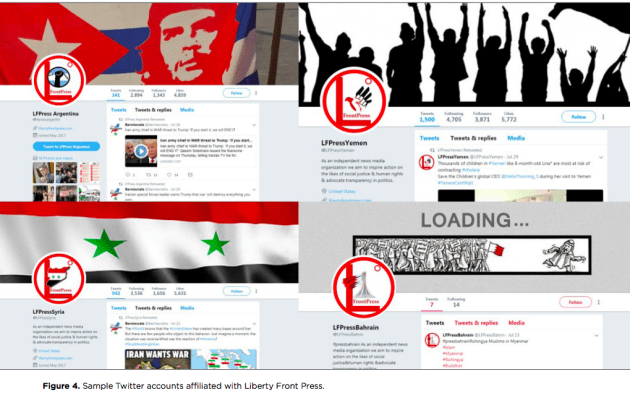 Liberty Front Press was linked to other activity that masqueraded as news organisations, including 12 pages and 66 accounts. 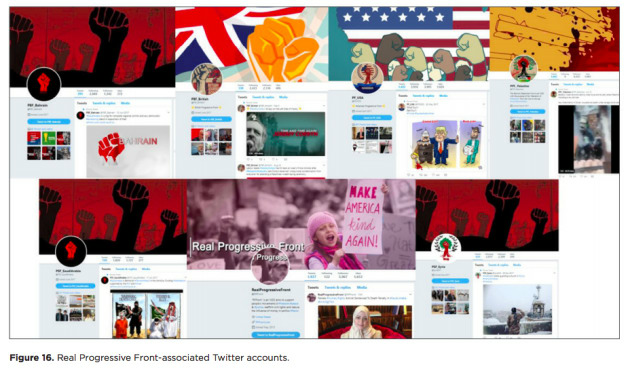 Another part of the FireEye probe found a further 168 pages, 140 Facebook accounts and 31 Instagram accounts that were used to spread Iranian propaganda to 813,000 followers, which included spending more than $6,000 on Facebook ads between July 2012 and April this year. 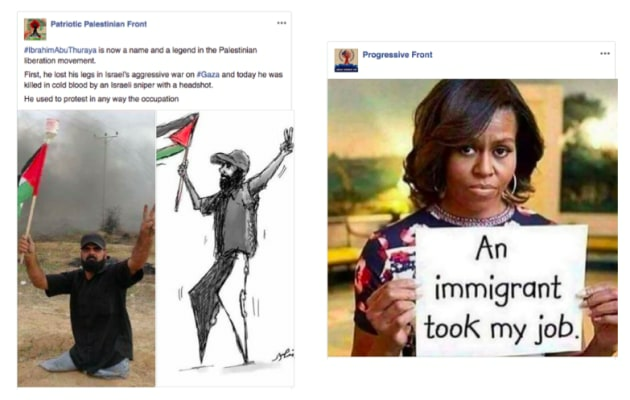 Examples of propaganda discovered by Facebook (see more below). Facebook director of security Chad Greene admits choosing whether to immediately shut down a cyber threat or continuing investigating the extent of it to prevent bad actors from operating in the future is a delicate balancing act. 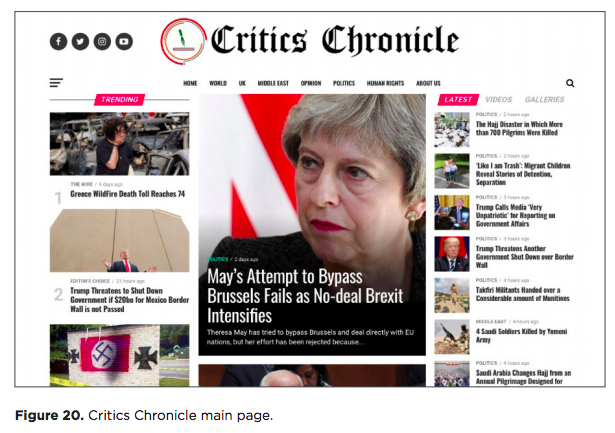 “When we identify a campaign, our aim is to learn as much as we can about: the extent of the bad actors’ presence on our services; their actions; and what we can do to deter them,” Greene explained in a bog. Facebook said it will take action as soon as it discovers there is an immediate threat to safety, which not only includes physical harm but also the potential to influence world events. 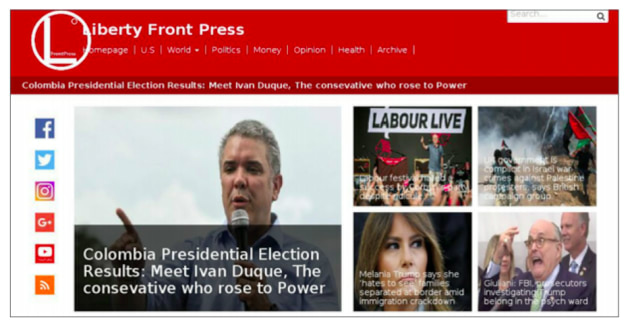 But as the Cambridge Analytica scandal illustrates, identifying a potential threat in time is not always easy in this perennial game of cat and mouse. Read the full FireEye report here. Check out the image gallery below for further examples. 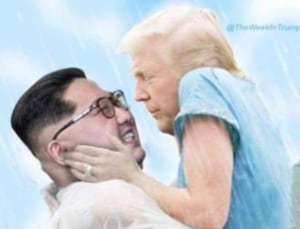 Some of the posts have been propagating anti-Trump imagery, like this romantic embrace of Kim Jong Un. 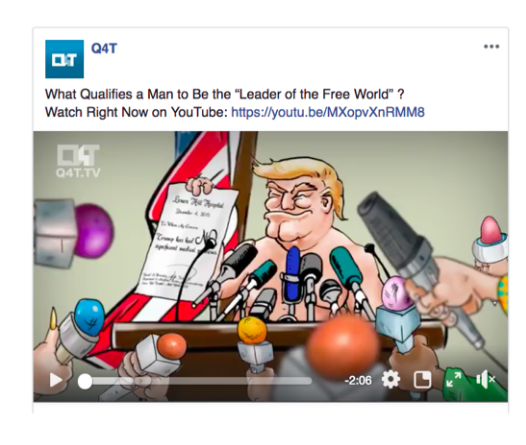 Google, Twitter and Facebook have stepped up efforts to combat inauthentic news sources and political influence campaigns. 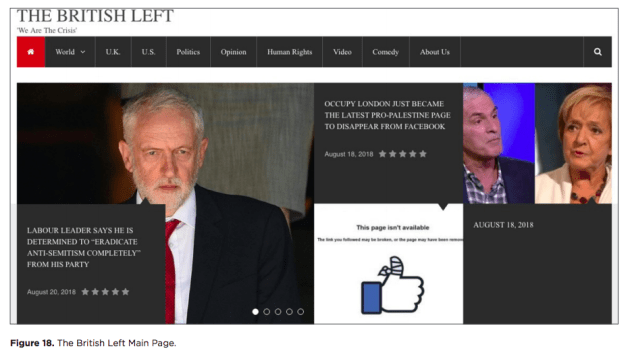 Facebook deleted 652 fake accounts and pages linked to Russia and Iran, while Google has banned 39 YouTube accounts linked to the Islamic Republic of Iran Broadcasting. 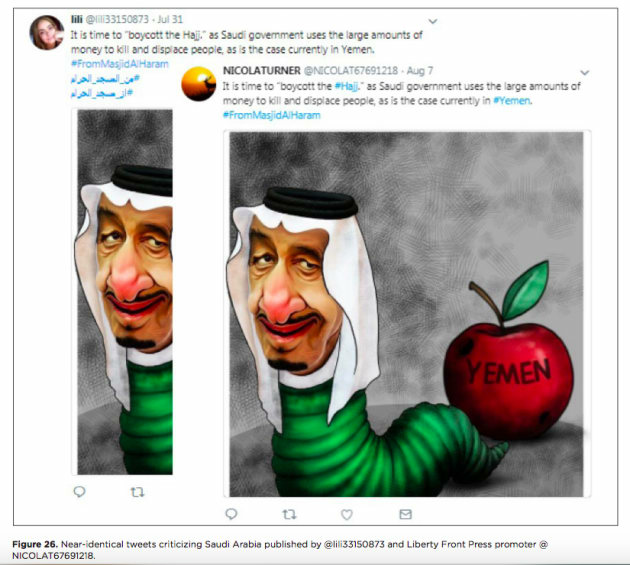 The social media giants were tipped off by US cyber security firm FireEye, which has released a report detailing suspected influence operations that originate in Iran and target audiences in the US, UK, Latin America and the Middle East. 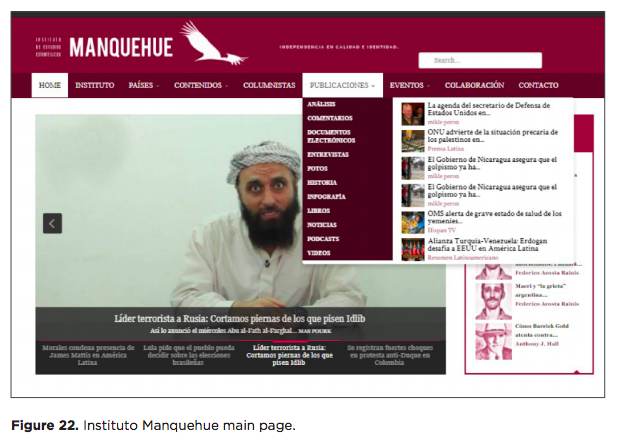 The operation uses a network of inauthentic websites peddling fake news and propaganda in line with Iranian interests. 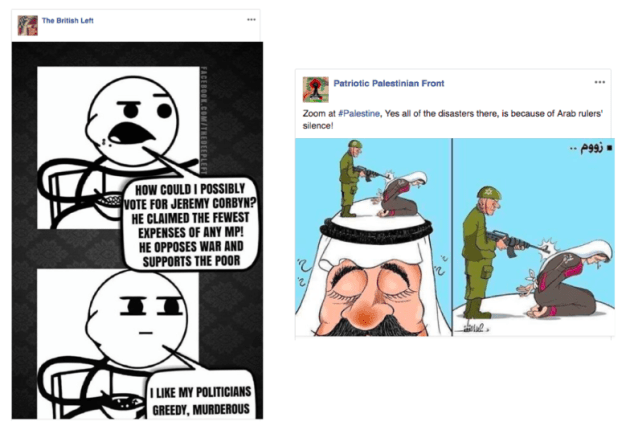 These include posts that are anti-Saudi, anti-Israel and pro-Palestinian. 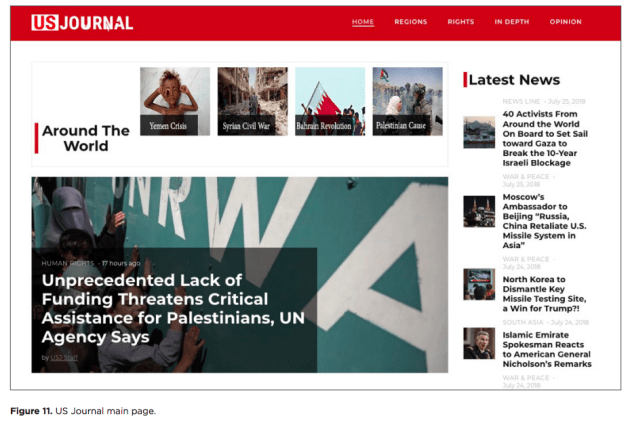 The news sources also support US policies that are favourable to Iran, such as the US-Iran nuclear deal, a policy that is widely supported by most of the world, including Europe, but not US president Donald Trump. 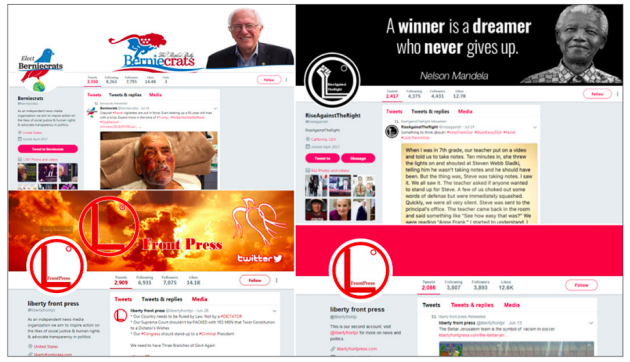 The messaging also includes anti-Trump posts and fraudulently aligning such content with US liberal identities like Bernie Sanders (see below).